A Ball Python curled up like a tabby cat. This is how my snake holding adventure begins. 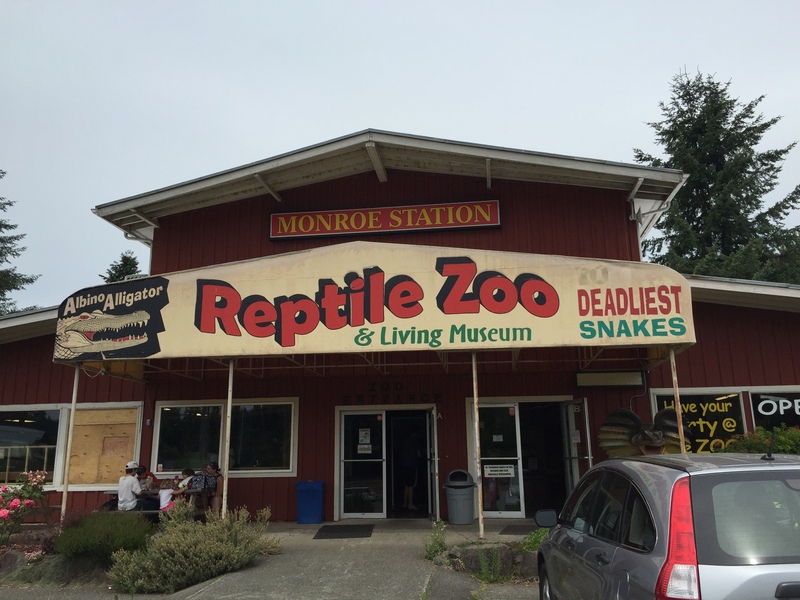 With a phone call to the Reptile Zoo in Monroe, Washington; with an opening line I’ve never (ever) uttered before. A real ice-breaker. This reply, from the Reptile Zoo Guy answering my phone call is quite a lot for me to digest. Did he just say only three feet long? Also, did he say PYTHON? And does he really have no reaction to my “I need to hold a big snake” demand? 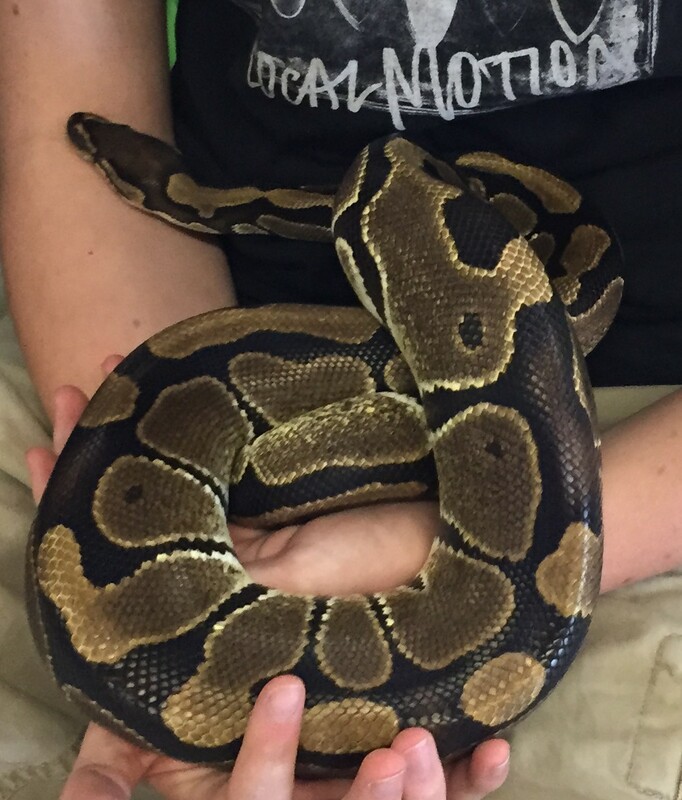 Is it par for the course that visitors to the Reptile Zoo don’t just want, but need to hold snakes? I bring my teenagers with me. They won’t be a source of moral support as Susie was when I ate an oyster or Mary was when I got arrested for a good cause, or Beth was when I hiked the Grand Canyon, or my writing group was when I submitted poems to the New Yorker. The Reptile Zoo. A snake-lover’s paradise…I’m sure. But one of the things I’m realizing about fear is that it limits you as a parent. So my children, who have been otherwise enriched by travel and museums and books have been denied all activities involving reptiles, poor things! I’ve never felt the least bit bad about this until today, when I realize that this will be a first, and that obviously, this puts me in the running for Parent of the Year. As I pay what seems like the very reasonable $8 per person admission, I re-introduce myself to the Reptile Zoo Guy, and mention that holding a big snake is a pretty big fear of mine. “We’ve only had four snake bites since I started here.” he says, real mellow-like. I reach across the counter and squeeze his arm. He shrugs. “Blah blah blah dog bites, blah blah blah statistics blah blah blah people asking for it because blah blah blah bothered the snakes” My ability to hear exactly what he’s saying has narrowed. All I’m thinking about is where are the snakes? When does the holding part happen? How soon can I be done with this? This is not the attitude I want to have, by the way. When I made my list I told myself that there should be no grinning and bearing it. No squeezing my eyes tight until the experience is over. I want to be in the moment because, I remind myself, the whole idea is to live, remember? You see a room full of snakes. And you find that your body is involuntarily melting down, and prickling up at the same time. I’m so clammy and woozy that I wonder if today might be the day that I nail #29. It turns out that I come by this reaction naturally. Our eyesight has evolved to see snakes so that we can get out of their damn way. Why? Because snakes are very deadly to humans. According to the World Health Organization, as many as 94,000 deaths from snakebite happen every year. The prime locations? South Asia, Southeast Asia, and sub-Saharan Africa. But just because I feel justified in my reaction, doesn’t mean I want to wallow in it. There’s an agenda here: I don’t want to cross South Asia, Southeast Asia and sub-Saharan Africa off my list of possible adventure destinations just because they are (it would seem) crawling with deadly snakes. What I want is to be brave. The Reptile Zoo Guy announces that it’s time to hold snakes. He has two kinds on offer: Corn Snakes, or the Ball Python. A small crowd sits in chairs and takes turns, mostly choosing Corn Snakes. They’re long skinny and active. Reptile Zoo Guy lays them over visitor’s shoulders like a hula girl welcoming people to Hawaii. And the corn snakes seem to be in on it, because they instantly tie themselves like leis around the recipient’s necks. I look at my kids and see one with a Corn Snake macrame’d around his neck. The other with a Ball Python curled in his lap. Both are smiling at me. They cannot wait to see me freak out. 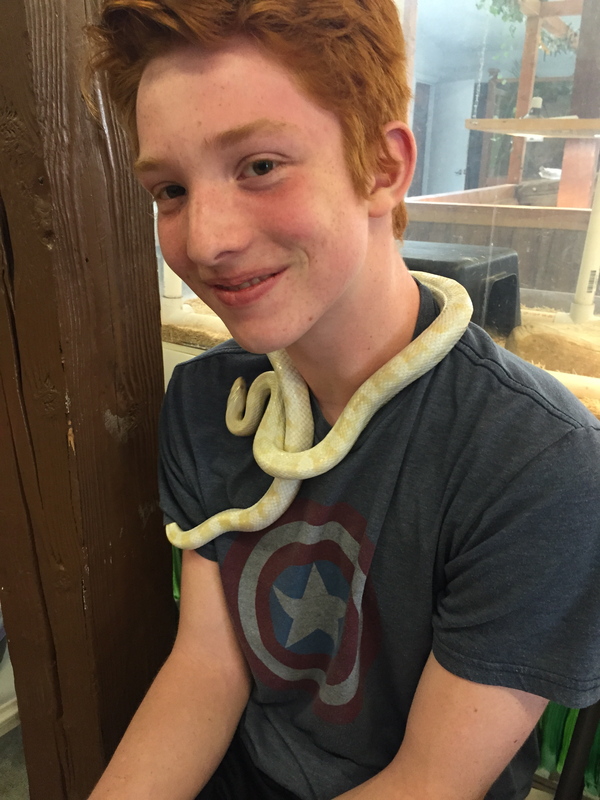 A Corn Snake knots itself around my son’s neck. But of course, snakes bear very little resemblance to cats, especially when you touch them. When Reptile Zoo Guy places the Ball Python in my hands I’m completely unprepared for it’s the marble-cool smoothness. I’m even less prepared for it’s weight or it’s muscled, undulating movement. I take a step back, and the python responds by wrapping itself around my arm. Yes, I came here to hold a big snake, but now the snake is holding me. It’s too much. I wiggle away, shuddering. Me (freaked out) attempting to hold a Ball Python, just before it decided to hold me. Afterwards, I walk around the parking lot, shaking off the revulsion that has just coursed through my whole body. The kids are enjoying the rest of the Zoo. They briefly show me the crocodile and a bright green 8-footer. But I’m brooding over how horrible that was. So far, facing my fears has brought terror, yes. But also sweet surprises and actual euphoria when I’ve gotten to the other side of fear. When I got off the ferris wheel or came back to earth after rock climbing or declared myself able to play catch. But this one has undone me. Maybe I really will cross big swaths of the world off my travel list because of snakes. And this thought makes me furious with myself. Even worse is the looming threat that there will be more of this. That riding in a helicopter or having a drink in a dive bar will undo me, too. “Hey, are you okay?” The Reptile Zoo Guy, crunches toward me, across the parking lot. It’s possibly one of the profoundest things I’ve heard on this journey so far. Another really excellent post, and with great advice at the end. I have to say that if you want to just go look at snakes and not have to pay $8 per person, you can go to Regina’s house. I think that one of hers is a corn snake, and not sure — the other might be a python (neither are poisonous at all). But I think that being able to hold a snake might not really address the issue of seeing them in person in the wild. I don’t mind holding Regina’s snakes, but don’t at all fancy the idea of meeting them head-on outside of her company. Good work, in any case, and we will look forward to the next adventure. Thanks, Teri! I completely spaced out the fact that Gina has snakes and invited me (months ago!) to come hold them! UGH! Since facing this fear, I’ve heard lots of “snakes-in-the-wild” stories and some of them are intense! I think of snakes as being fearful, but some snakes are aggressive and will come at you. Ack! I hope that you consider this one accomplished, and are moving on. Very best wishes! Well done, and I love the comfort zone advice.